Adam, regardless of being a dog person, falls in love with The Curse of the Cat People. 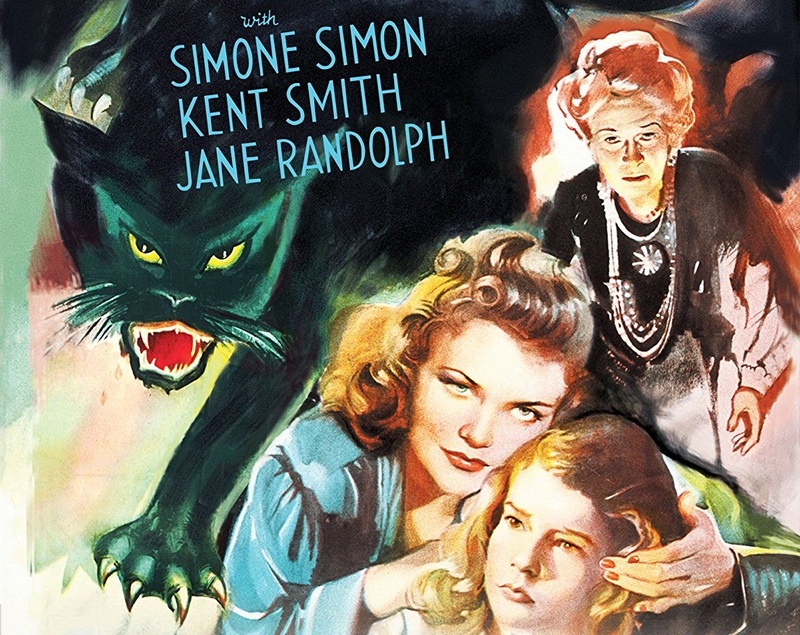 The Val Lewton produced sequel to the classic horror (Cat People) is being released by Scream Factory on Blu-Ray. This is how you do a sequel! The Curse of the Cat People, the 1944 sequel to the dyed-in-the-wool Classic Cat People is an all-together different piece of genre filmmaking. Trading in its monster pedigree for a haunting ghost story that is more spooky and emotional than one would ever expect. The film manages to take the threads of the first film and spin a sequel that is almost as visually surprising and beautifully rendered as its predecessor. It has been seven years since the events of the original film. Oliver Reed (Kent Smith) and Alice (Jane Randolph) the cheating husband and mistress of the original live a happy guilt-less life with their six-year-old daughter Amy (Ann Carter), in the non-disclosed suburbs. Amy is a solitary child unable to make friends or connect with the world at large. Her parents oblivious to their daughter’s plight could be the first helicopter parents of the golden age of cinema. Left to her own devices, Amy finds herself in front of Mrs. Julia Farren’s (Julia Dean) house. Mrs. Farren is one of the few people to treat Amy with kindness. This belies her more sinister nature of a woman who constantly says her daughter is dead though she is not (her daughter played by Elizabeth Russell, who cameoed in the original). How Irena (Simone Simon) and her ghost figure into the film ad, if she is a well-meaning or malicious soul, is the central conceit of the film. Gunther von Fritsch and Robert Wise fill in for Jacques Tourner’s magnificent and inventive direction. It says something about Tourner that it took two directors to fill the void left by his not returning. The co-directors do manage to find their own visually arresting style by having the story set during the Holiday season. That winter setting allows for some of the most haunting imagery in a “horror” film ever produced. Where Cat People’s visual style is designed for tension and scares, The Curse of the Cat People’s visual style, though built for tension is ultimate design is something wholly different and surprisingly emotional. If one can let go of the preconceived notion of what a horror sequel should be an audience will find one of the best examples of sequels in The Curse of the Cat People. Though only the characters remain this haunting ghost story is an emotionally satisfying conclusion to the original. Scream Factory’s transfer of the sequel rivals that of Criterion’s recent Blu-Ray release of the original Cat People. The major issue of any wintertime transfer is the snow, something that Curse has plenty of, which can cause aliasing. That problem is sidestepped entirely. What we get here is a clear almost hypnotic image. The black and white photography is perfectly rendered here with a beautiful sheen of grain that makes it feel like the best archival print you will see. Bravo to Scream Factory in producing such a wonderful transfer. The Commentary by Steve Haberman is solid informative commentary about producer Val Lewton and the production of this very odd film. The best feature of the disc is the Commentary by Greg Mank that features an audio-essay of sorts that collections reflections from Simone Simon herself. Mank comments on these, the film, and the production itself. It’s a wonderful commentary track that was initially included on the original DVD release some years ago. Lewton’s Muse: The Dark Eyes Of Simone Simon is a 45-minute visual essay by documentarian Constantine Nasr (see his documentary Shadows In The Dark: The Val Lewton Legacy on the Criterion Blu-Ray of Cat People) give the similar treatment here to Simon. The featurette is a brilliant discretion of a career that never took off the way it should have. Nasr recounts the sort of details that show not much has changed in the 70 years since Simon was a working actress. The audio interview with Ann Carter is a great piece that the actress recalls her time during the production. Scream Factory has produced a worthy edition of The Curse of the Cat People. With a near-perfect transfer, a wealth of thoughtful extras, this release should allow for a true reassessment of a forgotten but amazing sequel to an iconic Golden Age Horror Film. HIGHEST POSSIBLE RECOMMENDATIONS!!! !